Happy Monday! Today's Behind The Art Monday interview features Etsy shop joyuna. Her shop is filled with beautiful hand dyed yarns and knitted creations. She is also offering readers a 15% discount so head on over to her shop if you see something you like. Include the code "oceanside" in the notes to seller upon checkout. Hello, I'm Joyuna, and I make yarn. I'm a college student in Ohio, studying Linguistics, and selling on Etsy in my spare time to support my fiber habit. I spin, dye, and knit. I love knitting, and I've loved knitting ever since I learned. There's hardly a minute you can find me without needles. 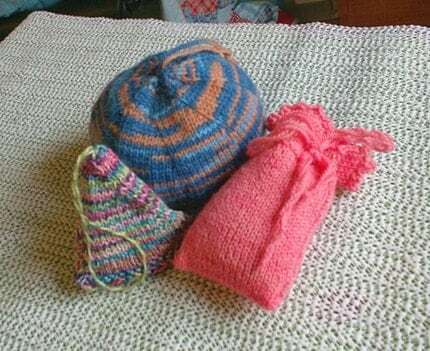 My addiction started with knitting, and then gradually grew to yarn and fiber in general. 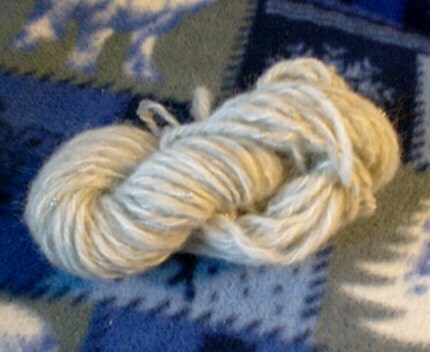 Now I spin handspun yarn on a drop spindle and a wheel, as well as dye yarn in my own kitchen in small batches. Most recently, I've been designing my own knitting patterns, which is a new and interesting challenge. My head is always full of patterns and colors. Give me a spare minute and I'll quickly begin filling the margins of a page with designs and ideas. Dyeing is so much fun because it's like I'm in elementary school art class all over again, mixing colors and seeing what turns out. My knitting is like that too - I improvise a lot of my designs, such as the knitted fruits. Those fruits actually started as an accident... I was trying to knit a sphere, and it turned into a lime! And then I started knitting other fruits, because people loved them. My shop is really just an excuse for me to create more things. I never would have started writing knitting patterns if I didn't have the shop. The shop gives me an opportunity to branch out and try things I never would have tried otherwise, because usually I'm knitting for myself. Now, I'm knitting and spinning for other people. Study... ha! I'm a full-time student, part-time crafter, though I wish it were the reverse. I also write articles for my blog, http://joyarna.blogspot.com . I love reading, writing, and learning languages. I've recently gotten into baking a lot. There really is nothing like fresh-baked bread! And it's a lot easier than you'd think. Up until now, I thought I was hopeless at cooking. But I'm having a lot of fun learning and improving. Just Etsy at the moment. I've been a buyer on Etsy for a lot longer than I've been a seller, so setting up shop there was the natural choice. I'm in a lot of places, under the username Joyuna. I'm an avid Twitterer http://twitter.com/Joyuna , I post photos on Flickr http://www.flickr.com/photos/11560411@N07/ , and I made yarn is on Facebook here http://tinyurl.com/c3sghu . Like I said, I blog at the Joyarna Knitblog http://joyarna.blogspot.com . 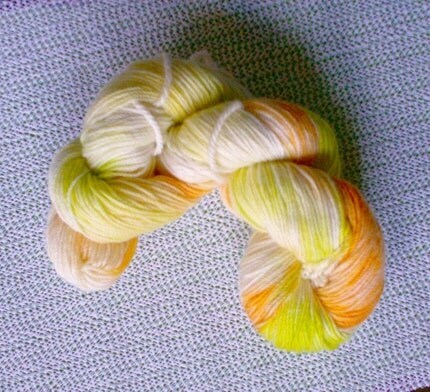 I'm also on Ravelry, where my username is Joyuna. I have a special connection with my handspun yarns, since I've worked so hard at them. It's a little like magic to take a ball of fluff and transform it into something you can use. My favorite skein of handspun is the beaded alpaca. It was an experiment, but one that I think turned out very well. Patience! I've always been a very impatient person, but since learning to knit I know that patience is rewarded with great results. I'm learning that with my Etsy shop too, because I'm starting to gain some success. You can see more of Joyuna's work in her Etsy shop. She would like to offer readers a 15% discount when you include the code "oceanside" in notes to seller upon checkout. Be sure to check out the giveaways going on now in the left sidebar.